This is a real photograph taken on the 9th green at the Yellowstone Club in Big Sky, Montana. It was taken by Charles Lindsay who indicated that he also had an animal handler on site for precaution so the golfers are actually not quite as scared as you might assume. I’ve seen many varieties of wildlife on the golf course from mountain lions, snakes, monkeys, wild boar, moose, brown and black bear, and more, but there’s one specie that really scares me – grizzly bears. I was visiting the highly acclaimed Jasper Park golf course in Alberta, Canada and dining with their Director of Golf Alan Carter. After dinner, Alan was called away to join rangers (real wildlife rangers not golf course ones) to scare off a grizzly bear that had visited the property. The next morning the grizzly was back and my dawn tee time as a single was delayed. Of course, I had no problem with that. I was told that Albertans pride themselves on their ability to safely deal with wandering bears. I was, however, forewarned to look out for any signs of this grizzly back in the remotely secluded woods surrounding the 8th green and 9th tee areas. As I approached the area, I was downright nervous. You see, on the second fairway I spotted an 18” high pile of dung that was fresh and with steam even still coming off of it. There was no one playing with me so I had no hope of being the faster in the area as is often joked. It was just I and the golf course, and a grizzly? I hit the uphill 8th green in regulations and ran to the green and quickly two-putted. The 9th hole is a gorgeous par-three, one of the most widely acclaimed ones in the world – if fact I had cut out a picture of it for my golf scrapbook way back in 1962. I had to play it. I did – quickly. As I left that area of the golf course, I felt relieved. The bear was probably long gone, but you must take them seriously, particularly the grizzly. Grizzly bears will force the closure of a golf course on a moment’s notice. There’s good reason too. They are at the top of the food chain, can outrun any human, climb trees or at least wait at the bottom of them, and swim. If they want you, you’re dead meat – no mulligans. 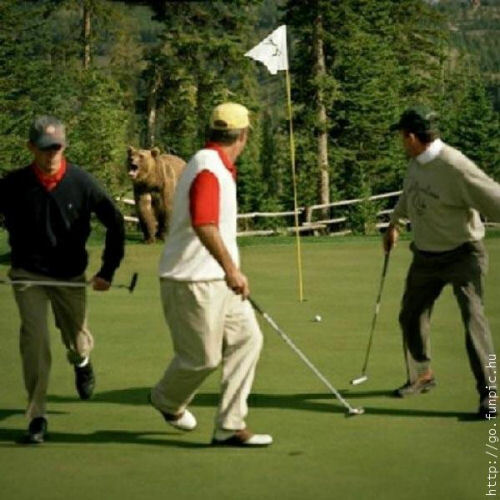 The Montana State Department of Fish and Wildlife (2012) is advising golfers to take extra precautions and be on the alert for bears while playing National Forests golf courses. Now many bears would rather stay away from golfers unless you startle them or get between them and their young. An aggressive grizzly really doesn’t care. It is also a good idea to watch for signs of bear activity. Golfers should be able to recognize the difference between black bear and grizzly bear droppings on the golf course. Black bear droppings are smaller and contain berries and possibly squirrel fur. Grizzly bear droppings have small bells in them and smell like pepper spray.